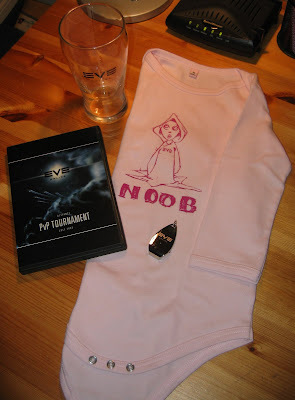 CrazyKinux's Musing: EVE Gifts from CK to CrazyKinux! The one sticky point with the tournament disc is that it might not work in your standalone DVD player due to the format. So you might end up like me, only able to watch it on your PC's DVD drive. For the complete experience, I suggest you get your daughter to pour the beer for you (whilst in the noobsuit, obviously). She'll have to learn sometime, it may as well be now. That noob suit is the cutest!!! @Blinky - Turned out you were right! @Zapatero - You know what, I might actually let her do that on Fathers Day!